********************** Vactor Ranch ************** – ……………………………………………………………………. Community Association ………………………………………………. Vactor Ranch is a gated community on the northeast side of Tucson. 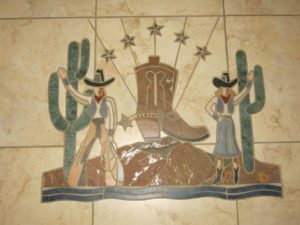 The rich history and environment of Southern Arizona is a part of the community that is built on a portion of the former Rancho Del Rio Guest Ranch where The Tack Room Restaurant was formerly located. 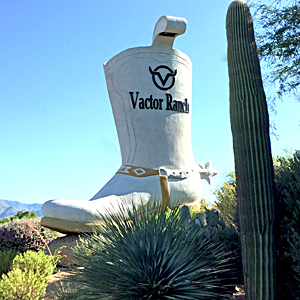 It is easily recognized by the landmark 16 foot high cowboy boot near the entrance to the property on Sabino Canyon Road. For a more detailed history in printable PDF, please click HERE. The community is conveniently located near shopping, restaurants, Udall Park, recreational activities and Sabino Canyon which all contribute to making it one of the most highly prized locations in the city of Tucson. This superbly maintained, small neighborhood of 126 homes has a heated swimming pool, clubhouse, sidewalks for easy walking, common areas with gorgeous southwestern landscaping and wonderful views of the surrounding mountain ranges. The superb quality of craftsmanship in the homes includes wonderful floor plans with amenities like high ceilings, fireplaces, private patios and gourmet kitchens.